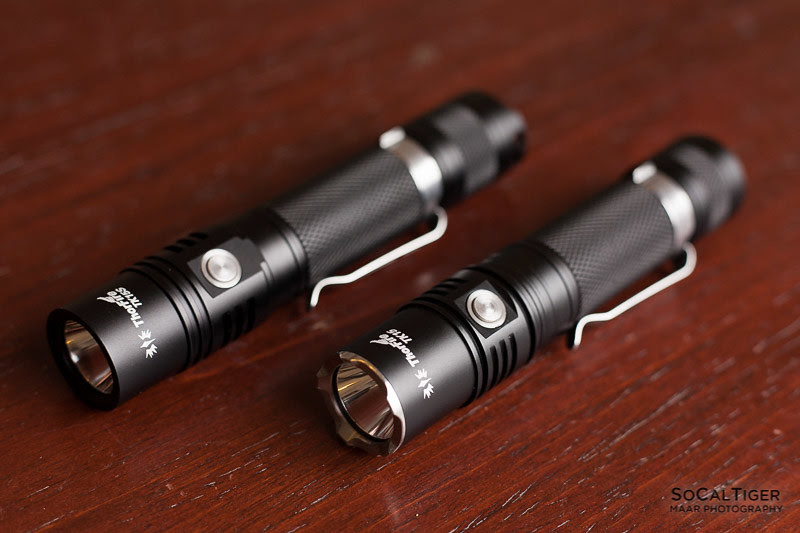 The Thorfire TK15 and TK15S are Thorfire's newest 18650 flashlights and arriving at US retailers this month. 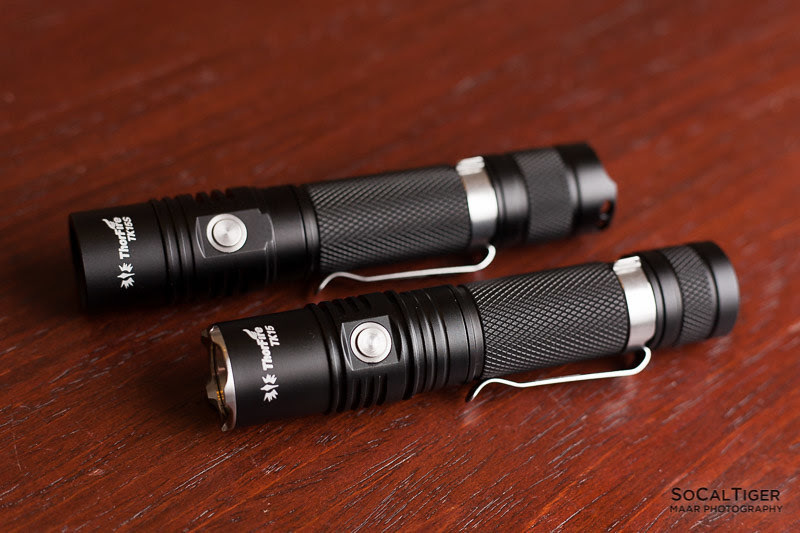 Both the TK15 and TK15S are powered by a single 18650 and are in the 18650 EDC tube light category. 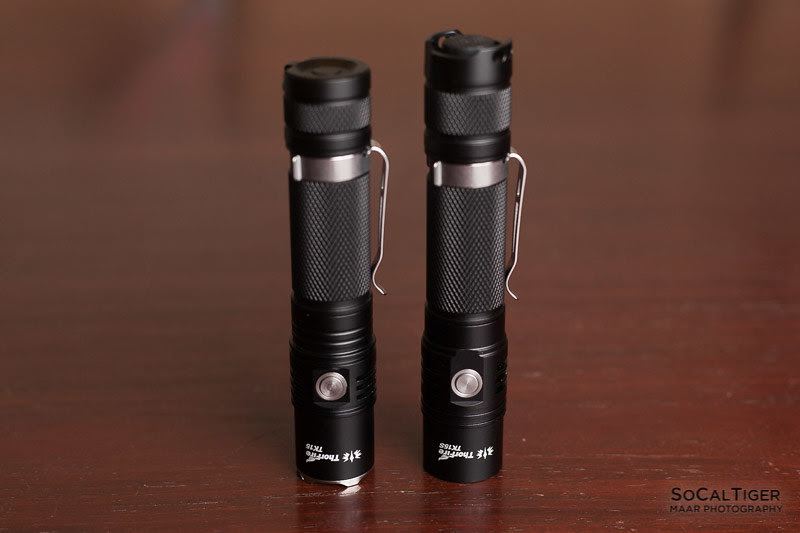 Both utilize a domed Cree XP-L2 (I believe it is the V6 3D common to the Q8) in a polished reflector with balanced general purpose beams. Output is speced at a max of 1050 lumens and both also have moonlight modes which I measured at 2 lumens. 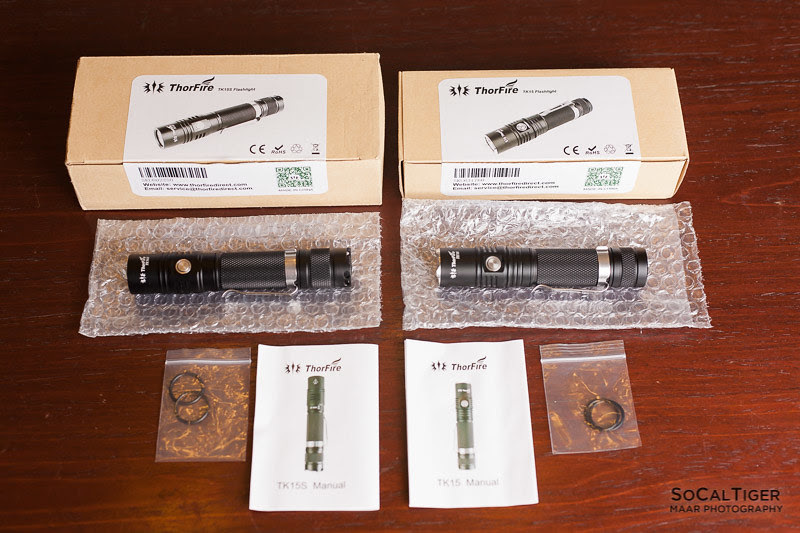 The TK15 and TK15S both come from the factory with a very pleasant warm-neutral tint of 4600-4700K. The TK15 works off a single side-switch while the TK15S has both a side-switch for changing modes and a tail-switch to cut off power entirely. The TK15 and TK15S also have slightly different firmware and mode spacing - the TK15 has 5 modes (although Moon is hidden) and the TK15S has 4 modes (Moon is not hidden). 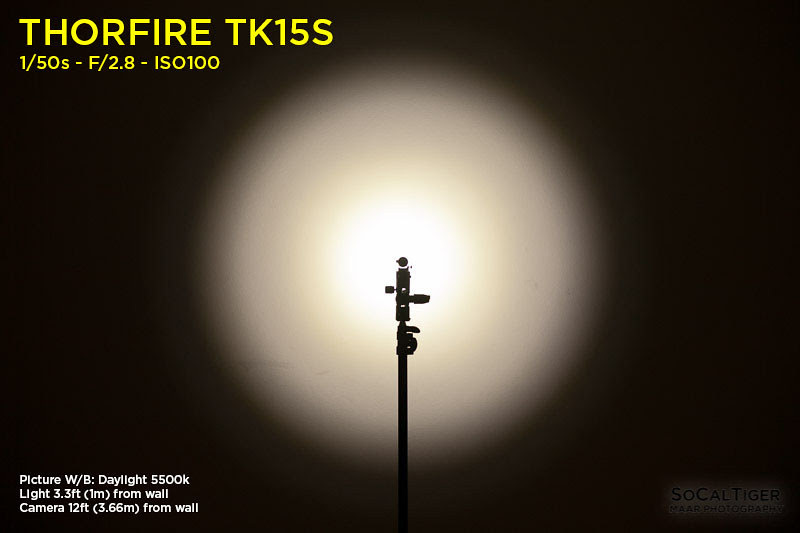 The TK15S has both a normal strobe and a useful bike strobe. I was provided a copy for review by Thorfire. 1. 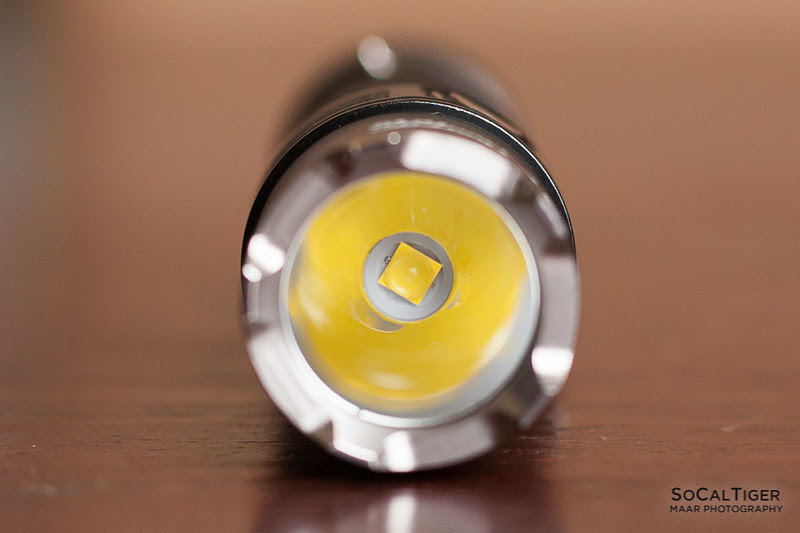 Cree XP-L2 LED with a lifespan of 20 years. 2. Use one 18650 3.7V battery (not provided). 5. Side switch for power on/off and mode selection. 6. Made of aircraft-grade aluminum. 7. High efficiency lens with anti-reflective coating. 5. Tail switch for power on/off and side switch for mode selection. The TK15 and TK15S arrived in standard cardboard boxes like most Thorfire lights. One difference I noticed from prior Thorfire lights was that the box was taped shut with the label. This is a good improvement because it prevents the box from coming open during shipping. The light is protected in a bubble-wrap sleeve and there is foam padding on both the top and bottom of the box. Accessories included clips (pre-installed), 2 spare O-rings and manual. The packaging is more than sufficient in addition to the mailer packaging. There is no significant risk of damage or scuffing to the light during delivery using this packaging. This packaging is better than I have seen for some other lights (in other lights I've experienced scuffed finishes from poor packaging). 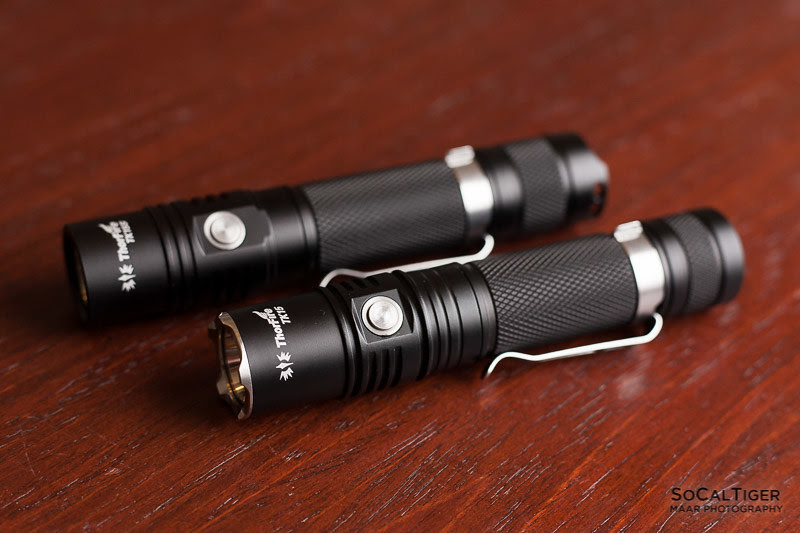 The TK15 and TK15S have smooth black anodizing. The anodizing was applied well and my copy did not have any notable defects in the finish. The anodizing has a nice non-glossy sheen and I feel that this finish looks very nice and professional in quality. The anodizing is also applied to both the head and tail threads. 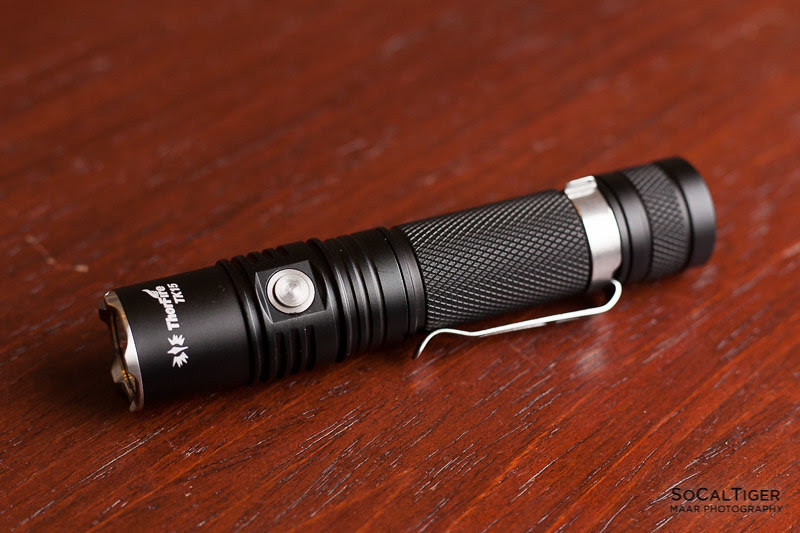 The body of the light is a 18650-size EDC tube design that some people also may describe as an "S design". The threads lego with some other popular brands in this category but may or may not make proper electrical contact. Of course, the threads of both lights lego with each other so the head, body and tail and all interchangeable. The width is similar to fat marker. It is a little thicker but shorter than a dry erase marker. Due to the design, there is minimal roll-resistance unless the clip is attached. The TK15S has a tail-switch but the TK15 does not. The threads were cut perfectly square and a nice touch is the anodizing on both the head and tail threads. No lanyard or case/holster included. The included clip is great although I would have also liked a lanyard. I also would have preferred "deep carry" clips (or both clips). Both lights can tail-stand on a level surface and are stable. However, installing a lanyard will de-stablize tail standing somewhat on the TK15S (not a problem on the TK15 since the lanyard point is offset). The light uses a side-switch to control on/off and modes. There is mode memory. The light will activate on the last used brightness. To turn MOON OFF, press switch (will turn light off). To turn STROBE ON, double-click side switch (when on). To turn STROBE OFF, press side switch (will return to previous mode). Comment 1: I wish that Moon was not hidden (but that you could always start on moon with a long-press). Comment 2: I wish that double-click did not turn on strobe because it is possible to activate strobe on accident. Even better, it would be nice if the flashlight was programmable so that you could disable options like strobe or mode memory. It would also be nice to be able to program the mode order. The light has a rear forward-clicky (On/Off/Momentary) and uses a side-switch to control modes. Strobe & bike strobe are hidden. To turn the light ON (MOMENTARY), partial press and hold tail switch. You can also switch modes while on momentary. To turn the light ON, press tail switch. To turn the light OFF, press tail switch. To turn BIKE STROBE ON, long-press side switch (when on). To turn BIKE STROBE OFF, press side switch (will return to previous mode). Comment 1: I like the mode rotation (which goes up then back down). The side switch UI is very intuitive. I also like that Moon is not hidden (part of the normal mode rotation). Measurements were done using a freshly charged EVVA protected Panasonic NCR18650B. The TK15 and TK15S have slightly different mode spacing. 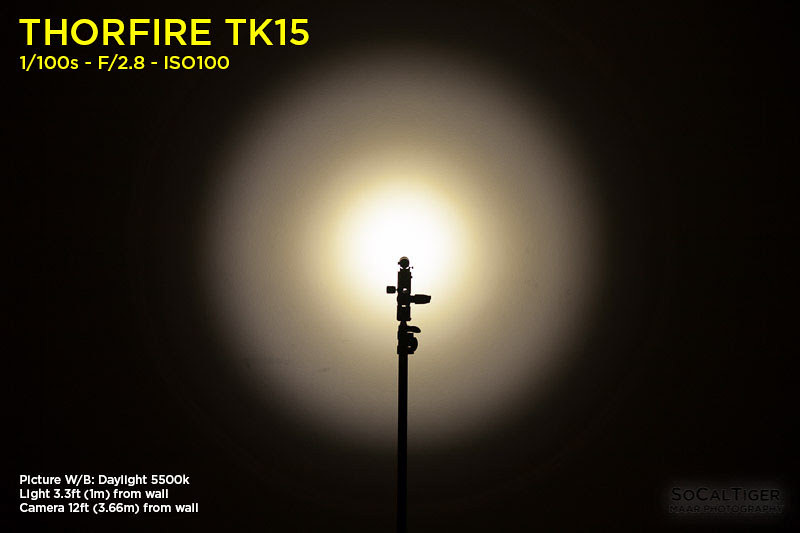 The TK15 has 5 modes (although Moon is hidden) and the TK15S has 4 modes (Moon is not hidden). 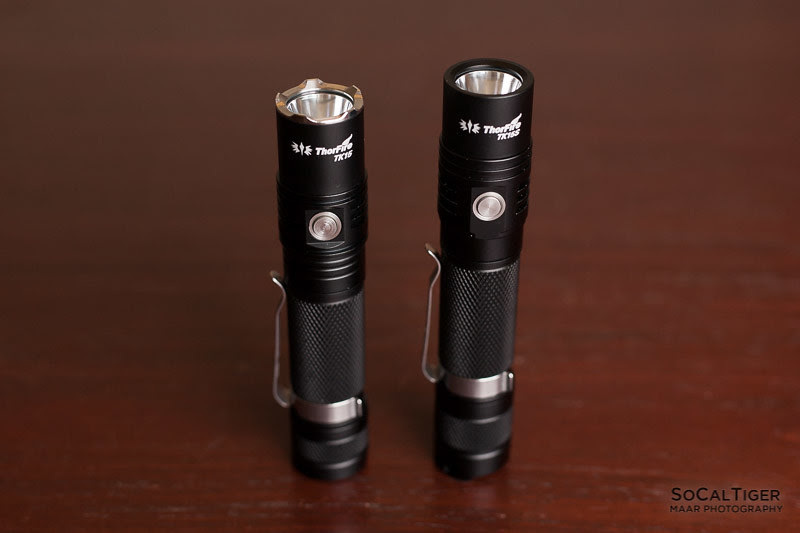 At maximum output on both, I estimate output is 1100+ lumens at 30 seconds after peaks of 1200+ lumens. 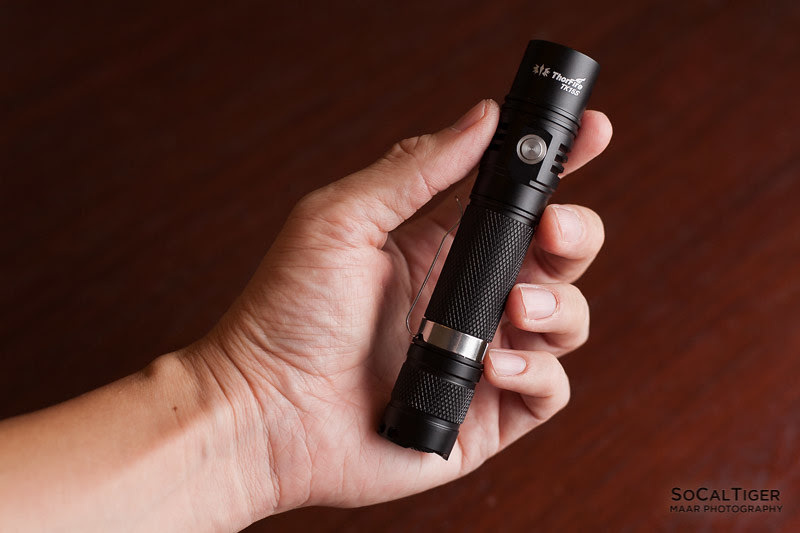 This clears the stated output of 1050 lumens. The Moon mode on both was measured at exactly 2 lumens for me. At maximum output on both lights, the tube gets pretty warm so this should be considered "Turbo". At the ~500 lumen settings (which run at about 1A), the tube stays at a comfortable temperature even in 80F/27C weather. 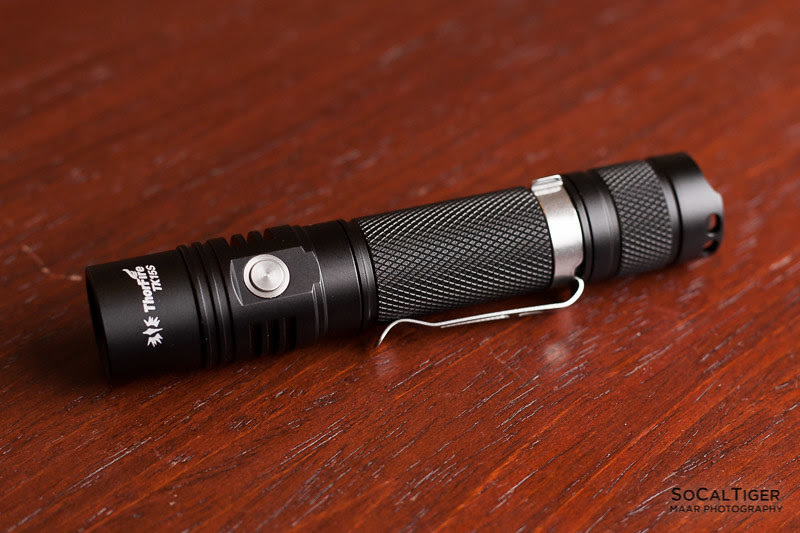 Comment: Between the 2 spacing options, I slightly prefer the TK15 since it has 5 modes. Although, I would have preferred if Moon was not hidden (but that you could still start in Moon with a long-press). This light has timed step-downs on the 2 highest settings. * From maximum/Turbo, the light will step-down after 2.5 (TK15) to 3 (TK15S) minutes. * From the 2nd highest setting, the light will step-down against after 30 minutes. * The light does not get that hot on Medium. I suspect that the step-down at 30 minutes is in the interest of saving energy as well as to provide extended run-times since the light can run for a very long time on Low. * On Low, the light is barely warm. * Low and Moon both have very long runtimes. Balanced General Purpose. 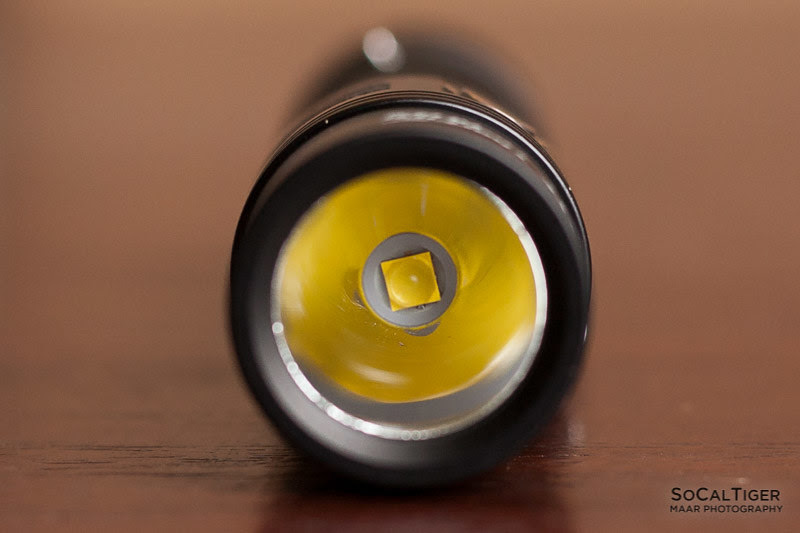 Both the TK15 and TK15S use a domed Cree XP-L2 (most likely the V6 3D shared with the Q8) in a polished reflector. The beam is very balanced for general purpose use with a relatively large hotspot. The hotspot is large and transitions smoothly and gradually throughout the beam. The beam has defined edges. This light works very well for people seeking a more balanced beam. This light works great for general purpose use both indoors and outdoors. 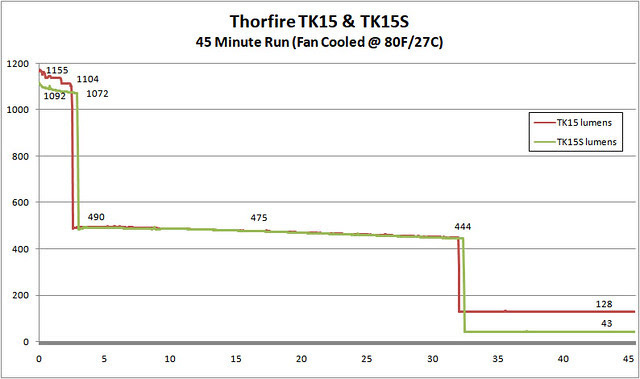 The TK15 and TK15S have a very nice warm neutral white of 4600-4700K. When white-balanced in Adobe Lightroom against "Daylight 5500K", the beamshots appear slightly warm to neutral. The light appears slightly warm white in practice. This is a very good choice of default color temperature and I'm really happy to see a manufacturer using this color temperature for a light. Protected Batteries Fit. The EVVA Protected Panasonic NCR18650B fits length-wise at 69.5mm and width-wise at 18.67mm. My protected NCR18650GAs also fit. However, both protected batteries are a little tight (the GAs more so) and you can feel the springs compressing as you put on the cap. Button vs Flat-Top: My batteries were button-top. Flat-top batteries should also fit due to the dual battery springs (the positive & negative contacts are both springs). You can physically lock-out the light by loosening the tail (or head) one-half turn to break the circuit. 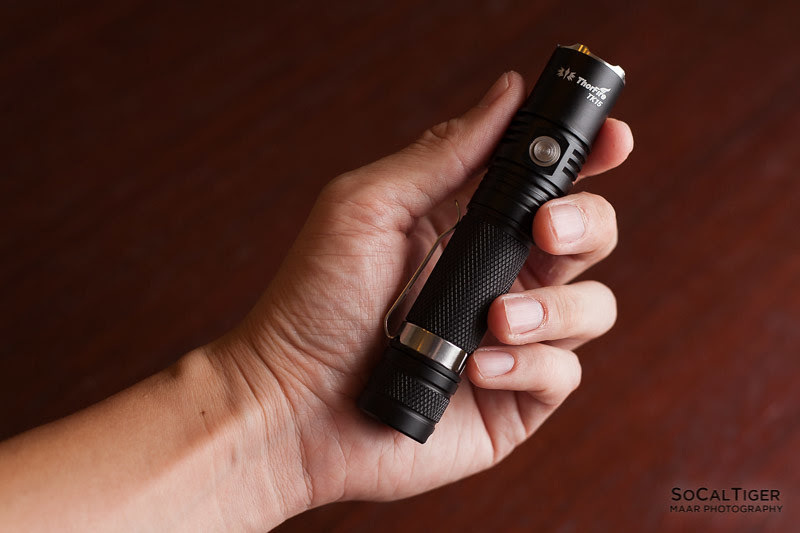 If there is a possibility of accidental activation, you should lock-out the light, especially on the TK15 since it can be activated using only the side-switch. 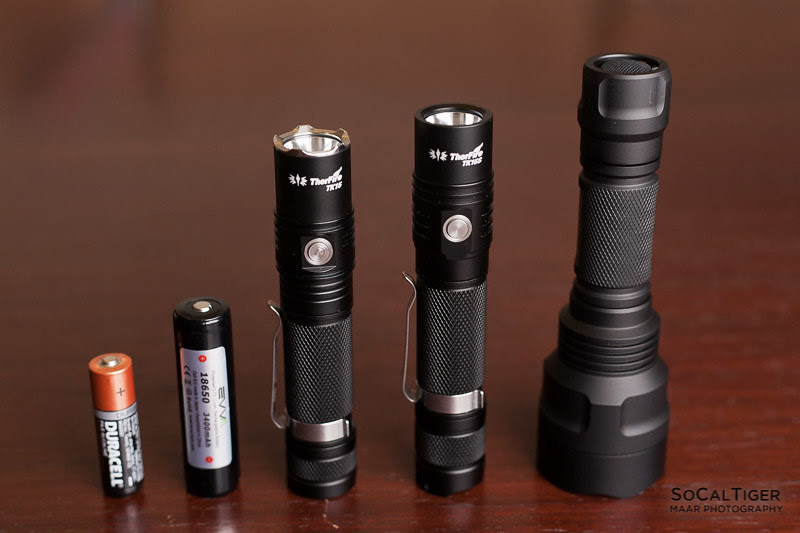 Flashlight pictured next to a AA, 18650 and C8 for size reference. 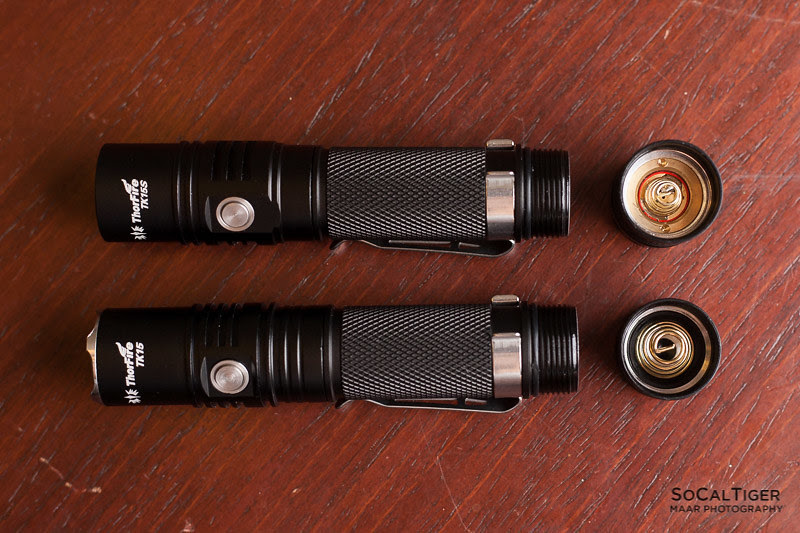 Both the TK15 and TK15S are very good, well-built 1x18650 EDC tube lights which performs above spec at 1100+ lumens on Turbo. Like most tube lights, the highest setting gets very warm. 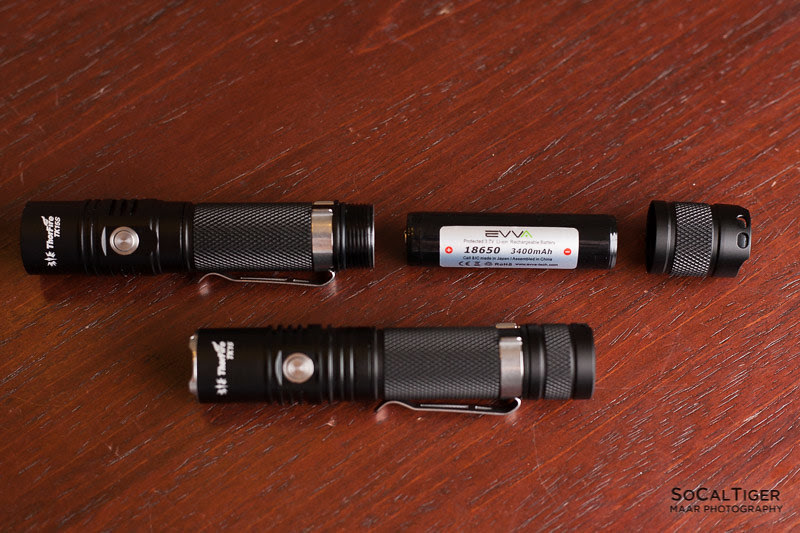 However, the ~500 lumen settings run at about 1A and can easily sustain longer runtimes. For people who mainly use Low or Moon, this light will provide great run times. Between the two lights, I prefer having 5 modes (TK15) and the mode spacing of the TK15 (although the spacing on both is workable). However, on the TK15 I wish that Moon was not hidden (but you could still start in Moon with a long-press). Switch-wise, I prefer having the tail-switch of the TK15S because the side-switch of the TK15 is easy to activate on accident. I also love the up/down ramping on the TK15S. I think that Moon is perfect at 2 lumens on both. 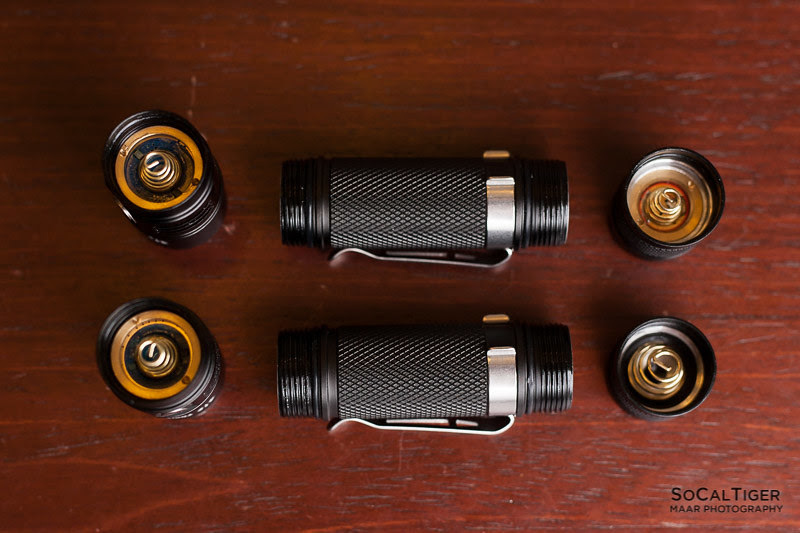 Both lights are good 18650-sized EDCs and will fit comfortably in dress pants, cargo shorts, jacket, etc. The finish looks excellent, is clean and my copy had no defects. The use of a forward-clicky in the tail for the TK15S is great for people who use/want momentary on. Style-wise, I slightly prefer the all black of the TK15S. Some people may prefer the bezel on the TK15. The beam profile of both is very balanced and is well-suited for general usage. I love the very pleasant 4600-4700K color temperature (warm neutral) and wish that more manufacturers made lights like this (I do not like cool white LEDs). My one "wish list" item for these lights (and many others) was if the firmware allowed the lights to be programmed (hidden programming mode). It would be great if users could set options like turning mode memory on/off or disabling strobe, etc. I prefer to always start in "Low" and I don't need strobe. Since everyone uses flashlights differently, this would be the best way to give options to everyone. The TK15S and SP31 have output measurements within 10% of each other in my copies. There are some subtle visual differences as well if you compare the pictures from my SP31 thread. The TK15S is also about 1mm longer in the head. The tube and tail have the same length although there’s a visual difference in the tubes too – the SP31 has some lines going through it. Y’know, I heard the rumors about Thorfire/Sofirn, but this is getting a little too coincidental. These, the SF36 and VG10S, Thorfire chargers shipping with Sofirn lights, a few other Thorfire/Sofirn “cousins” that I’ve seen. I believe their is only one manufacturer, since the boxes, accessories, drivers are identical and design are really similar. What a shame! It is a long story and so complex!!! Few hours ago, Wildcat emailed that he found out a thorfire charger are matched in our SP31 parcel. And now another one—-SF36 get a thorfire charger. It is a horrible. But we did made mistake when the charger’s manufacturer sent 2000pcs of 18650 USB charger in April. Today we checked every piece of USB charger left in our warehouse, these are “the rest 976 pic are Thorfire chargers”! We have contacted Thorfire’s manger Barry about this and both sides will negotiate about the compensation fee. And charger manufacturer also will make compensation to us. And we also like to do refund for our testers or customers if you did not want the charger, so please feel free to contact us. Honestly speaking, words as gun. But I 1000% sure that “Sofirn is the only brand which belongs to a manufacturer” and have none of relation with Thorfire directly. 1, If thorfire was just a different name of Sofirn, I guess that my boss would be crazily joy. As we all known, it is become harder and harder to establish a new brand. 3 years,5 years,10 years or even longer to make customers know it, right? 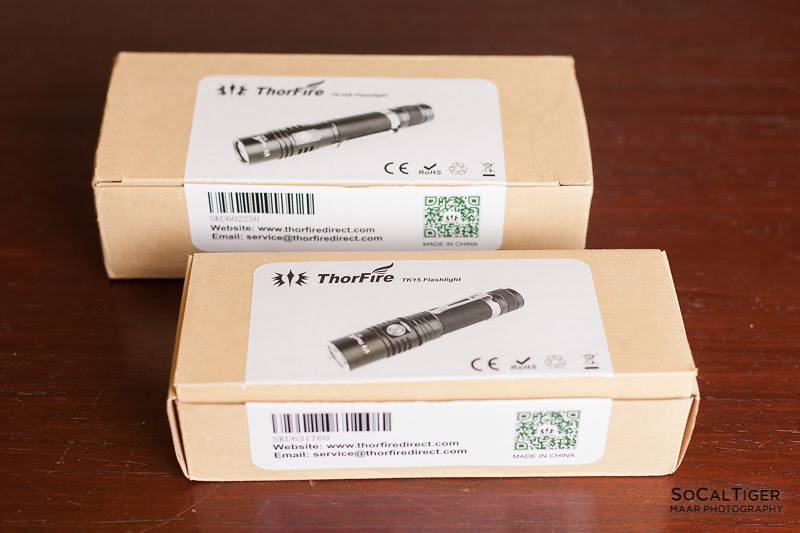 The info shows that the thorfire is also 4 years old and your guys love it and even order Q8 from thorfire, right? Yes, we wish sofirn were thorfire from this aspect. 2, No manufacturers can manufacture all material by themselves. For example, we purchase aluminum, bases, CREE LEDs, clips, batteries and O-rings, ect. 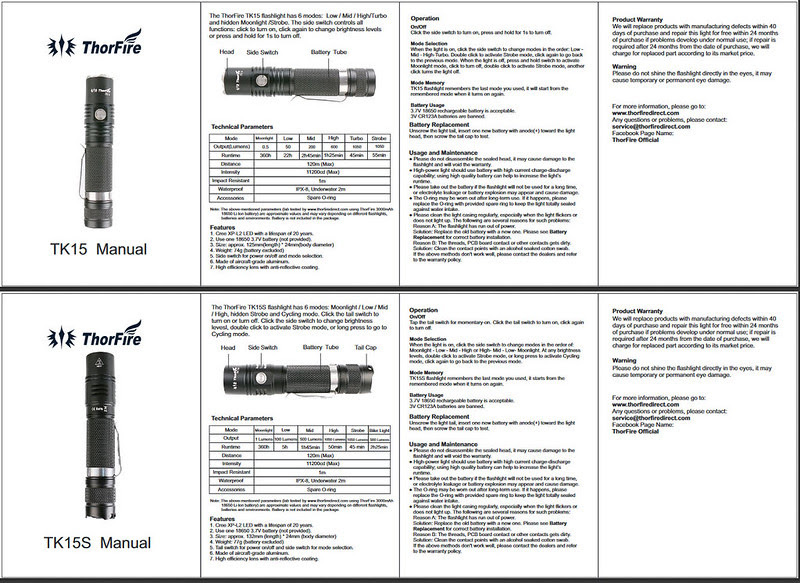 from other manufactures except flashlights. It is industrial chain. 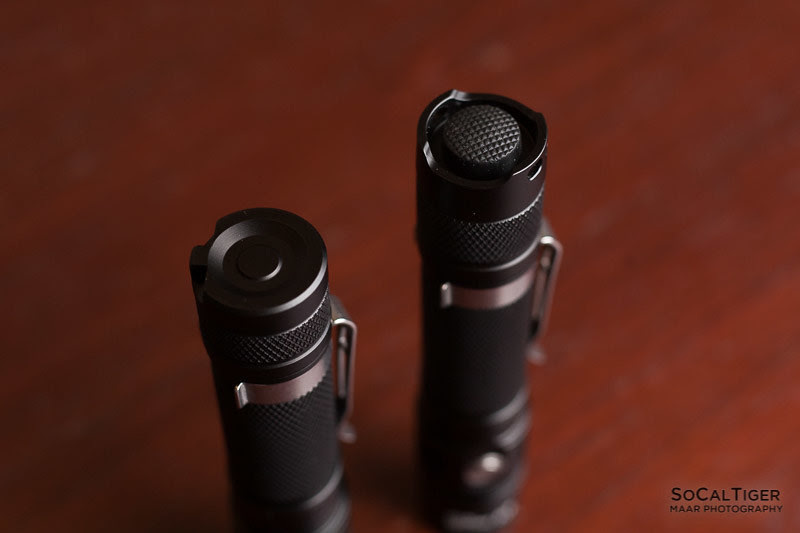 For example, we ordered clips from a first-class clip manufacturer who offers clips for Fenix and Nitecore. We order 18650 or nimh batteries from a battery manufacturer who offers batteries for EBL… I made sure that Sofirn order the similar 18650 charger from one manufacturer who always offered good service and products. 3, We would like to offer affordable and quality products for customers like Convoy or even Fenix. Innovation and high quality stands solidly behind Sofirn. Hope all friends can focus on the products and welcome to get your good feedbacks and suggestions to assist us to get better. Thank you so much and have a good time in Forum. Yeh, I saw that, but it’s still eerie, how so many striking lookalikes there are between T and S. If there’s no partnership, then it definitely looks like someone’s copying from someone else… a lot. I like both sets of lights, and both mfrs, so I ain’t got a dog in this fight, but one or the other should be pretty pissed at the blatant copying that seems to be going on. Thanks for the review. Interested in the forward clicky TK15S. I can’t even touch the quality of SoCalTiger’s review, but I will add my first impressions. And not just because I got a free one for a review. I really like this light. The ramping between modes on the TK15S is probably not useful, but I love it. It’s fun, and impressive. I still take it out of my pocket periodically, just to change modes and watch it slide up and down. For those of us that kinda secretly wish for a 1-mode flashlight sometimes, and mostly hate non-bike blinky modes the TK15S UI is awesome. Simple, intuitive, and non-intrusive. All the minor negatives with this light (no tint choices, no programmability, etc.) are actually advantages for muggles. This is a great light to give to friends or loan to family members. I have a TK15 on the way from Banggood. Since my needs are simple, I probably will get an Xtar VC2 Plus charger which I can get with Xtar 18650 2600mAh batteries at a good price. The size of the Xtars looks close to the maximum though. The review above said that Panasonic NCR18650B 3400mAH protected batteries are tight at 69.5 × 18.67. The Xtars are 68.8 × 18.6. 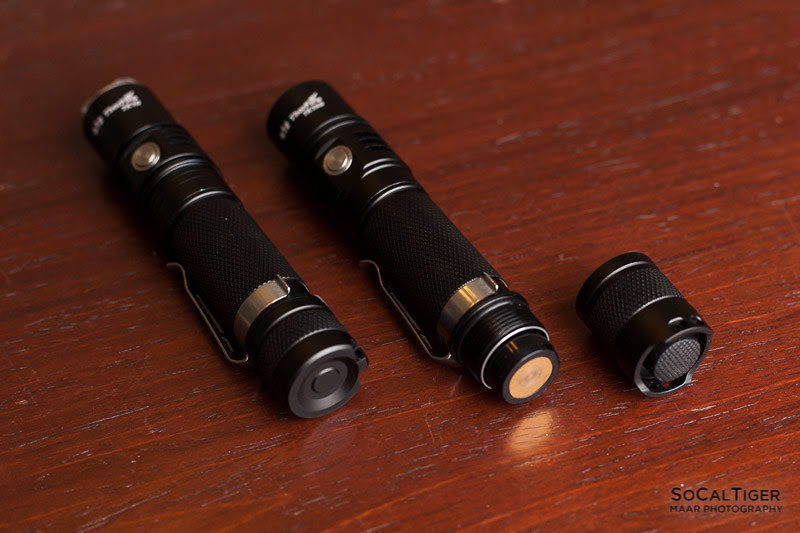 For the good of the flashlight itself, could there be any long-term problems with having tight fitting batteries? Do springs get worn out? My second choice would be the (apparently unprotected) flat top Panasonic NCR18650B 3400mAH (65 × 8.3). If the large size of the Xtars wouldn’t be a problem, I’d rather go with them. The measurement on those Xtars is a little shorter so I think it should be fine. Panasonic is a better brand although you’d be sacrificing the external protection circuit. The supplier of the Xtar cells is unknown and only speculation AFAIK. There is theoretically more wear on springs the more that they are compressed. However, in practice, this is probably not a real issue. Even if springs get too compressed over time, you can always stretch them back out. The compression/decompression itself causes micro-wear but this is not really detectable. Overall, this is probably going to be a non-issue for you. The only real concern would be if the fit was so tight that someone was using a lot of pressure screwing the cap on to the point of compromising the battery in some way (crushing a protection circuit, denting the battery, etc). I really like this light (TK15) and it almost being the same size as an S2! I read somewhere that it can actually handle 2* CR123s. I just wanted to get some feedback on that before burning a driver! Thank you. The SP32A v2 can, not sure about the TKs. Would be nice, though! The Sofirn just arrived in the mail yesterday! Wow! Even high is over 3A. But I gifted a TK15 and they like to keep it in a oven-hot vehicle. Gotta save a Li- ion! If I’m not mistaken, ’123s kinda start out at 2.5V or so, and fade downward from there. So 4.2V vs 5.0V? Dunno if I’d personally wanna try it, but I’d ask someone at Thorfire if the ’15 or ’18 can do it. I took the risk with the TK15. It didn't have a problem with 2* CR123s for the short time I ran it. In previous experience, the driver typically doesn't last more than a second when too much voltage is applied. With regard to CR123s, they're all around 3.3V+ unloaded and fresh. And Li primaries have very little V sag. It does work with an 8V input voltage. so it had me wondering.